“What is an open syllable?” is an important question we’ve talked about before in this blog. It is a syllable in which there are no consonants after a single vowel, resulting in the vowel making a long vowel sound. Eleven of the top hundred most commonly used words in English are are single-syllable, open-syllable words. (1) Examples of open syllable words from this popular set include I, he, me, she, no, so, my and by. 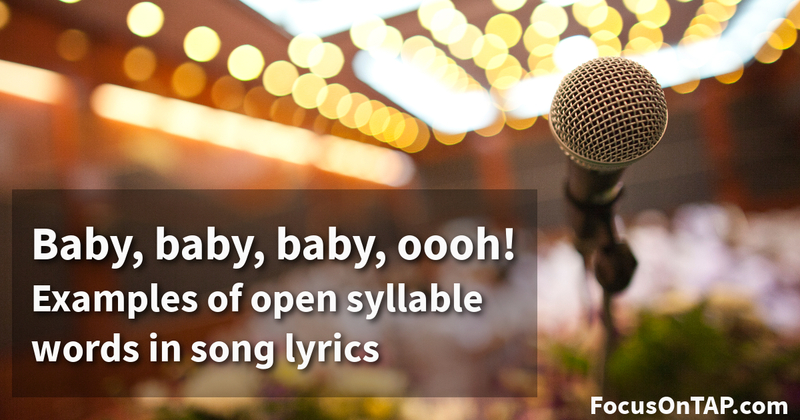 In this post, I’d like to give you some fun examples of open syllable words that are multi-syllable and used in pop songs new and old. I’ve linked to YouTube videos of all the songs because you know you’ll want to listen! OK, let’s get this one on the table right away. Not only is The Bieb a Canadian like our own app dev Greg McDonald but he gave us one of the best pop songs starring an open syllable word ever made on his 2010 debut album My World 2.0. Of course, we’re talking about “Baby”. Examples of open syllable words in PUNK songs! In fairness, this is more pop punk than punk, but you gotta love The Presidents. Other examples of open syllable words in great songs? So there you have it. Some great examples of open syllable words—BA·BY, CRA·ZY, SE·cret, E·ven, O·pen, FU·ture, SI·lent, E·vil and LA·DY—in great tunes. The bolded syllables in upper case are the open ones: no closing consonant after a single vowel with a resulting long vowel sound. By the way, most of these words are at level 6 in the phonics progression of our decodable books. Let us know some of your favourite songs with open-syllable words in the title in a comment. (1) This is according to The Oxford English Corpus: Facts about the language.